A telescopic sight on your hunting rifle offers a lot of advantages when hunting big game like deer. Of course, the sight gets you closer to your target, making aiming easier, and lessens the chance of you shooting at something you might not want to shoot. Scopes also allow you to get a good shot earlier or later than you might otherwise with a regular sight, as big game does most of its movement early or late in the day. The scope also allows greater precision and takes advantage of the technological advances in rifles and cartridges. Basically, a scope makes you more accurate in your shooting, whether you are hunting, plinking or in a competition. With the increasing popularity of scopes, some rifles don’t even have metal sights anymore. You can get as complex or as simple as you like. Remember, more expensive or bigger is not always better. In photography, the lens is more important than the camera. A cheap camera with a great lens will do well, but a cheap lens on a great camera is no better than if it were on a cheap camera. The same is true with scopes and rifles. It is no surprise that Nikon is a major supplier of scopes because optics are optics no matter what they are on. The scope allows you to see further, and to see better. Very slight variations matter when you are aiming at a deer 1000 yards away. Professional hunters say you should spend as much as you possibly can afford to on a high quality scope, even if you have to settle for a slightly cheaper gun than you originally wanted. When shopping for a scope or hunting binoculars, consider the kind of hunting you like, and the power of the scope. If you are hunting in a lot of cover, and what you are hunting is not too far away, you will need a lower-powered scope. If you are shooting at animals far away, you will need something more powerful. Many scopes today come with variable magnification, but you need the one that best fits your style. At less than $200, this simple scope from Nikon is one of the best available for the money. It has the famous Nikon optics. This is part of the new p-223 series for AR rifles. It is designed for quick sighting and great long range accuracy with .223 cartridges. The optics are multicoated to give brightness in low light. 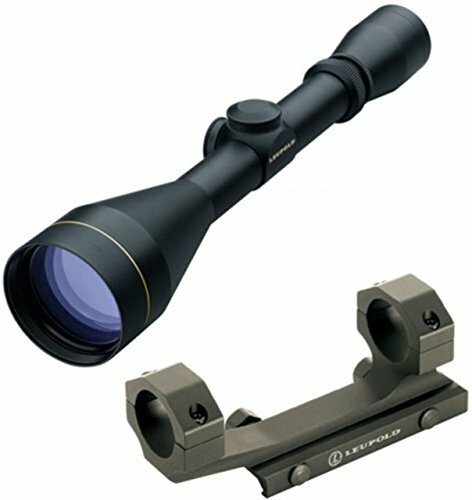 It has a variable magnification range to give flexibility in hunting. It is also optimized for Nikon’s spot-on technology which gives you exact aiming points automatically with your ammunition and load. 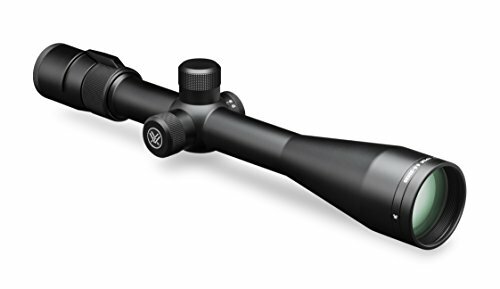 Its 3-9 magnification provides you with a very nice balance for close and far away shooting, and is about ideal for deer hunting. The only reported drawback is that it’s a little fuzzy at top magnification, and can blur slightly in indoor lighting. Otherwise, it has rave rifle scope reviews from customers who have used it. Every hunter is different, hunts in various places and has different needs. There are also people who like to shoot but don’t hunt. Whether you are shopping for yourself or choosing a gift for your hunter buddy, find one that fits all requirements. With the increase in sales of guns, scope sales have also increased, and manufacturers continue to give us more options and even wider price ranges. There are scopes that top $3,000, and you can get scopes for under $100. One thing to realize, especially when you get to the higher dollar scopes, is that a slight change in quality can cost a lot. As you get more accuracy, better lighting, and easier focus, you get into more cost. For instance, it may cost you several hundred dollars to get three percent more light transmission. Some hunters recommend the $250-$300 price range. You get good enough optics for most hunting and target practice settings. More is not always better. Lower magnification is often better because you can still shoot at a long distance as well as at closer objects. With higher power, you have less light, and your field of view is smaller, making adjusting to your target more difficult. It is important to get the right tool for the job. A writer with Optics Planet says you might even be less accurate with a more powerful scope because you can have too much power. If you are shooting something close, under 100 yards, you need the lowest power possible. The average deer scope used to be in the 3-9 power range, which most of the time is a good range for both close up and not so close. With super powerful scopes, you will have more to deal with while hunting. You don’t want to have to worry about how to operate the scope while you are trying to take a shot at that prize white-tail you have been tracking for months. A simpler, fewer-bells-and-whistles scope that isn’t top dollar is your best bet for most hunting trips. In some ways, a hunting rifle scope is just a telescope mounted on top of a rifle. But when you go shopping for one, you will see a myriad of numbers and technological terms that can make the uninitiated person’s head spin. The most basic information gives the magnification power and the lens diameter. This appears like 3x32mm. This would mean the magnification is three times its original size, and the second number refers to the width at the furthermost end of the scope—called the objective lens. This refers to the power of the scope. A 4x, for example, shows it will magnify the object four times. Remember more is not always better. In close cover, you will have a hard time focusing on a far away object, so power gets in your way there. There are also adjustable power scopes, which are often stated as 3x-9x. With adjustable power, you can have a lot more versatility with your scope. Light transmission is the light that is transmitted to your eye. A scope does not really magnify the light. The more light, the more costly the scope. Eye relief is the distance you can hold your eye back from the scope and still see well enough to shoot, usually three or four inches. This is important with rifles that have a lot of recoil and can cause an eye injury. The objective lens is the furthest front part of the scope, referring to that piece of glass. Tube size is how wide the scope is in the middle. Both of these affect how much light gets through to your eye. These are what used to be called cross hairs, which you aim with while shooting. There are several different types of scopes that can help your shooting. There are simple cross patterns all the way to complex grid patterns available. The main kinds include Duplex, Mildot and BCD reticles. The Duplex is a basic cross hair type, but wider at the edges which is good for low light. The Mildot has dots near the center, and these can be used to calculate range, for making quick adjustments for wind and elevation. BDC stands for bullet drop compensator. This allows accurate shooting at different distances without adjusting the settings of the scope. There are different aiming points to use for various distances. Parallax refers to an object appearing to move when looked at from a slightly different angle, though the object did not really move. This applies only to higher powered scopes with a magnification power of 10 or more. When you look into a scope, your eye is not in exactly the same position it was last time, so you are viewing it at a slightly different view. At long distances, that slight amount can make a big difference in the accuracy of your shot. Powerful scopes have a parallax adjustment feature, and some air guns do as well. This is often called the field of vision and is a term similar to one used in photography. It is the area that you see through the scope. You will have a wider field of view with a lower power scope, which is good for closer targets. The more powerful the magnification, the more your field of view will shrink. For consistency, numbers used in gun specs refer to the field of view at 100 yards. A typical 3x scope has a field of view of about 30 feet at 100 yards, and about 15 feet with a 9x scope. These refer to the two basic types of ways scopes are adjusted, and both have strengths and weaknesses. MOA is the most popular, and refers to “minute of angle.” MRAD refers to “milliradian” which is based on the idea of mls, or thousandths. With MOA you may make adjustments of one inch at 100 yards. It allows for precise zeroing in on the target because the increments are smaller. This is great for being precise at long range, further than 1,000 yards. The only problem is that it’s a lot harder to calculate when the range is not 1,000 yards. They work best when used with a duplex reticle. MRAD is similar to the MOA but uses 1,000 instead of 100 as its base for calculations. It can get more complicated than the MOA, but the MRAD is used more like a ruler, so the calculations are easier. There are extra knobs on an MRAD-equipped rifle, and that can be a distraction in the field, or in the woods. The MRAD option is useful for long range only. Just a few years ago Nikon revolutionized this technology with its spot-on technology website. For decades BDC dials and reticles were used and were set for just a few types of cartridges. This was not terribly reliable. Nikon’s technology took something that gave a close estimate and made it much more precise. You enter any cartridge’s ballistic information into the site, and you will get the trajectory information. The information works at any magnification or distance and will work with any type of scope. This makes much longer shots possible and increases accuracy. Other companies are now making similar technology, but it was Nikon that set the gold standard. Rings, mounts, and bases are what connect the scope to your rifle, and are the weakest link in your whole system. If they are not mounted correctly, the scope will never work properly and will never be accurate. These need to be the right size and need to be sturdy, so don’t scrimp here. Often it is difficult to tell if they are not mounted properly until you are in the field. There are systems for mounting that are either permanent or removable, which is useful if you plan on using the scope on more than one gun. Rings are what attach the scope to the rifle, and they correspond to the base they were designed for. There is the Weaver system, the Picatinny Rails, and the Leupold system, which should always be matched. Nikon has an S series that fits Weaver or Picatinny Rails. The rings go around the tube of the scope and should fit well enough to hold it in place with absolutely no movement. 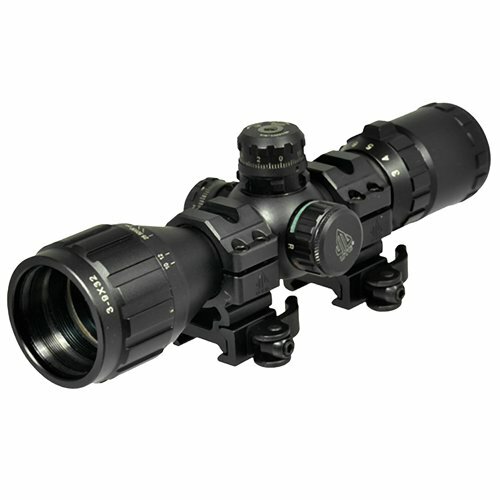 A very lightweight, compact scope at a low price. Features include a one-inch tube, emerald coating, lockable and resettable turrets. Mil-dot reticle along with red/green dual illumination adds visibility in low light conditions. This scope is entirely sealed, nitrogen filled, shockproof and waterproof. It has flip open lens caps, detachable rings, and has a two-inch sunshade. 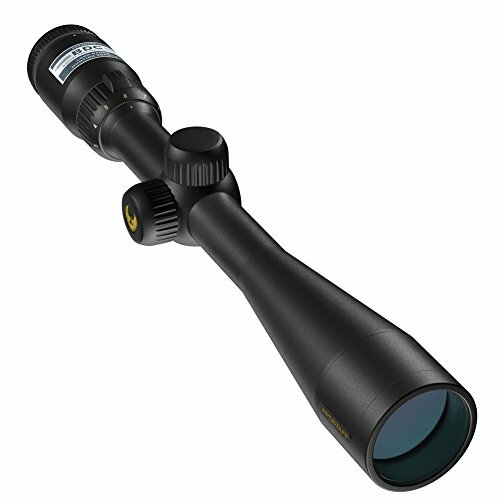 The 3-9 magnification range is suitable for most hunting conditions. The detachable rings make it easy to install, and it is easy to set up. This is another low-cost scope, and this one adds extra brilliance for when hunting conditions are not ideal. It has a large objective lens and multicoated optics that deliver high contrast views. The 12 magnification gives you a little extra in that department and is adjustable for the wind, elevation, and other conditions. 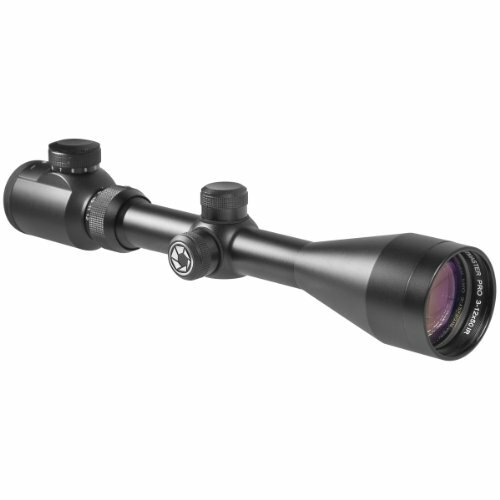 This scope has a 2.7 inch eye relief and weighs just over 21 ounces. The appearance of extra light comes from its advanced center-lit 30/30 infrared illuminated reticle. The reticle has 11 brightness settings, so it isn’t a distraction in bright light either. Easy to set up and zero in. This is another offering in the Nikon P-233 series, and has great reviews for the most part. It uses Nikon’s patented BDC reticles developed for the trajectory of .223 Rem 5.56 Nato rounds. The reticle is unique in that it offers aiming points and hash marks between 100 and 600 yards. It has a 100-parallax setting for precise shooting and has bright optics that provide 98 percent light transmission. It has tactical-style turrets with a zero reset to simplify adjustments in the field and works on a broad range of AR platforms. It is compact and lightweight. Windage and elevation dials can be set back to zero after zeroing in the rifle. Nikon’s spot on website technology. Compact, 15.5 inches long and ships at 1.9 pounds. This is a tough, small scope with a lot of magnification. It is made of aircraft-grade aluminum, so it is strong but light at just over 14 ounces. It has a BDC dead hold reticle. The dead hold reticle gives superior wind holdover even at long range. 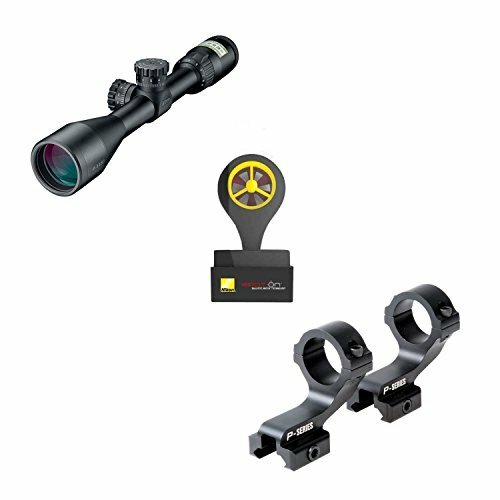 This scope is designed for the big game or predators and can be used by muzzle-loaders. It is argon purged for waterproof and fog proof features. Lenses are locked in with locking rings that help with resistance to recoil. It has a black matte finish. Reviews indicate this scope struggles at higher ends, but has a great sweet spot that is very good in the middle ranges. This is a small but powerful scope from Leupold. Its tube is 12.4 inches long and one inch in diameter. It has standard 3-9 magnification, and has a large 50mm end piece or objective lens. It has lead-free glass and multi-coated lenses. It has Leupold’s standard lockable eyepiece. The scope is water- and fog proof, and has easy to adjust dials for quick adjustments. It has a matte black finish, and while it is small, it has a sturdy feel. It utilizes an LR duplex reticle and has a Mark 2 integrated mount system. A little pricier than similar scopes made by others. This is a very lightweight, powerful scope. It has the standard 3-9 magnification, but adds the strength of a 40mm objective lens for a nice field of view. It has a matte black finish. 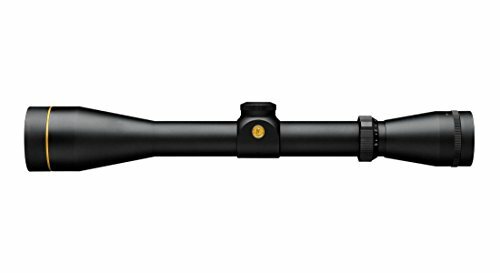 This scope weighs 11.2 ounces, and is 14 inches long with a one-inch tube. It has a Duplex reticle, and can be mounted with different types of mounts on just about any rifle. It has a wide field of view for fast finding of game. Turrets may be turned manually without tools. Many hunters like this for deer hunting. Does not come with a sun shade. This Nikon product has a 40mm objective lens, and a little bit more than the standard magnification at 4-12. It has a multicoated optical system that transmits 98 percent of light. It has a nice 3.7 inches of eye relief, and zero-reset turrets with a spring loaded adjustment knob. The scope uses a BDC reticle and has a quick focus eyepiece. It is also small and lightweight at 14 inches. The see-through circles in the BDC reticle allow advantages at long range, but still give a normal view in standard shooting. It offers a lot of adjustments for hunting in different conditions. Eye relief is a safe distance and is forgiving. Perfect for hunting, but not as ideal for target shooting. This is a quality scope from Nikon in the M223 series. The BDC reticles have open circle aiming points, along with marks up to 600 yards. It has a wide magnification range with a 42mm objective lens. This Nikon has one-piece aluminum aircraft-grade one-inch tube to make it strong and light. It has waterproof and fogproof properties with a lifetime warranty. This scope is built for AR rifles, and shooters who want speed and accuracy. 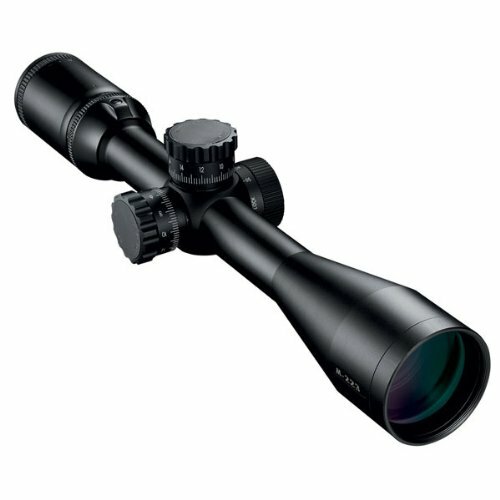 This scope has the quality to be good for competitive shooting as well as hunting in various conditions. It allows 95 percent of the light through, and has Nikon quality optics. Wide field of view at low magnification and quality view at the high end. This is a high-tech scope that offers a lot of help with shooting. The mil dot reticle helps estimate range, windage, holdover and other variables. It has capped turrets that allow for quick adjustment, and no tools are needed. Turrets are capped, so they won’t move by themselves. It is made of a single piece of 30mm tube and has smooth magnification in the lens mechanism. It has side knob parallax adjustment for fast adjustments in the field. Mil dot reticle does not change with magnification, making high magnification range less accurate. This scope is at the higher end of the spectrum of scopes, built to have repeatable accuracy in harsh environments. With 24 magnification, you can shoot at objects far away. It has six models available and reticles available in either the first or second focal plane. This scope is built from airplane-grade aluminum and weighs 1.5 pounds. The scope is 18 inches long and has a 50mm objective lens. 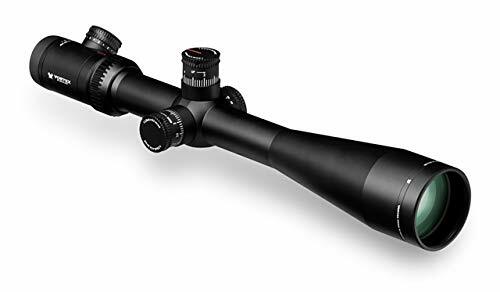 The construction gives a great field of view even at high magnification and works well on high performance rifles made for rough environments.